Cubans use a stovetop coffee maker to make Cuban coffee. Nothing fancy, no expensive expresso machines here…a $15 stove top coffee maker is all we need! There are different types of Cuban coffee. Well, let me correct myself…There are different way that we take our Cuban coffee. Un Cafecito, un Cortadito, and un Cafe´con leche. 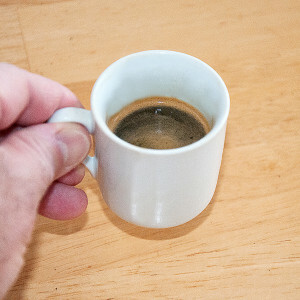 Is the most comment Cuban coffee we drink – black expresso coffee with just sugar. The cortadito is a basic Cuban coffee (cafecito) with milk ( 50% coffee / 50 % milk). Cafe´on leche is a cafecito with a cup of steaming milk. In most cases, it is not combined and you add the cafe according to your taste preference. Traditionally is also has a sprinkle of salt, sugar to taste, and just a tip of butter. How to make Cuban coffee using a stovetop cafetera. Add your freshly ground coffee to the strainer and pack down just a little bit and fill to the top and tap down again. Place the strainer into the bottom half, screw the top of the pot on and place on the stove top at medium to high heat. The brewing should take 5 to 10 minutes. When the coffee pot starts to gurgle and reaches the coffee fills the top half, remove it from the heat. Take a teaspoonful of the freshly brewed coffee and put it in your coffee cup. Add the desired amount of sugar and mix in a rapid motion creating a froth ( the coffee and sugar will turn a light tan color) Add your coffee and enjoy your cafecito!